A few weeks ago I taught my first 'Make Your Own Ring' class. A friend had said to me that she really wanted to make herself a ring, but she didn't know how or where to go about this. A little lightbulb pinged in my brain and that's when I offered to teach her at my home studio, a little bit of texting tennis with dates and we were set! Having not taught anyone to make jewellery before I have to admit I was pretty nervous, what if I couldn't explain techniques clearly, should I get public liability insurance? What if they burnt my house down with the blow torch? What if they stuck their hands in the pickle? Worries set aside and several cups of tea, some lunch and a lot of laughing later we had the finished products. 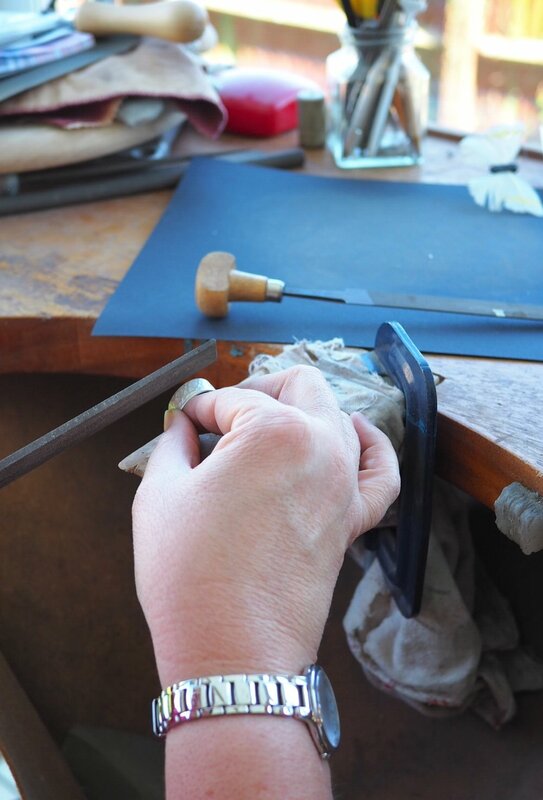 Concentrating on teaching (along with being a bit nervous) I forgot to take any pictures to begin with but once the ladies had soldered their rings together and they were taking shape we a started to gain a bit more confidence. 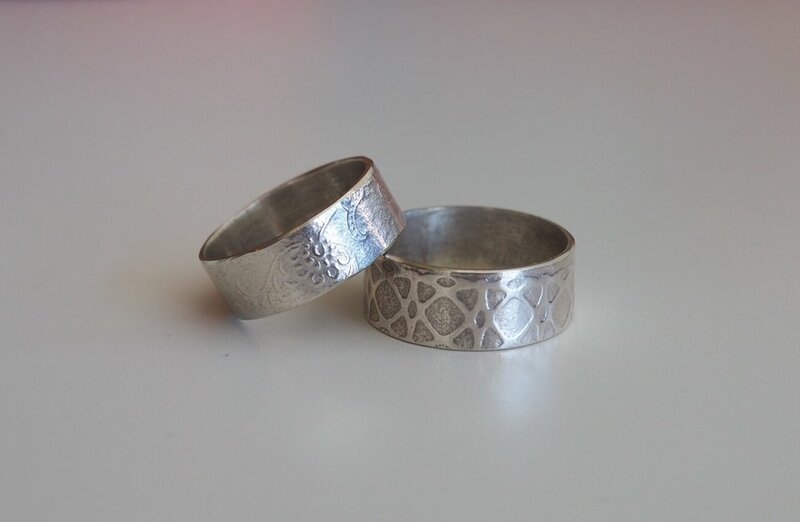 Both the ladies I taught opted for patterned rings rather than plain or hammered so they got to have a play with the rolling mill too by rolling their own patterns onto the silver. I hadn't realised before but being left handed means I work in my own unique way a lot of the time so working with someone who wasn't a lefty made me really stand back and look at how I do certain processes and to be mindful of this when demonstrating and explaining things. This was such a fun day, both of my students were really pleased with their rings and how they turned out, they went away with beaming smiles itching to show off the jewellery they created. They also intend to come back for lesson number two! I had so much fun sharing my skills with people who wanted to learn them, so I have decided to start offering a Beginner Silver Jewellery Workshop. If you are local to Sussex and would like to spend some time learning some basic silversmith techniques then please feel free to get in touch via my contact page!